The Saint is shown as an old man, bearded and balding. He sits on a chair at a writing desk with his back towards the viewer. He turns to his left, pen in hand, looking upwards and is watched alertly by the lion seated at his side, who raises his left paw. A pair of shears and a knife are strapped to the side of the desk. The setting is a dais within an open loggia with arched windows and in the distance is a finely detailed townscape of domed and Gothic buildings. Popham suggested this subject was ‘St Jerome, Flemish, c.1530 Aerdt Ortkens’, although St Jerome is customarily shown in a wilderness with his Cardinal’s hat and neither element features in this scene. Berserik proposes St Mark, dates the panel at 1520 and suggests a German origin, however St Mark’s lion is usually winged. For a discussion of Aert van Ortkens and the Pseudo-Ortkens school, see Timothy B. Husband, The Luminous Image, Painted Glass Roundels in the Lowlands, 1480-1560. New York: Metropolitan Museum, 1995, Chapter 8. 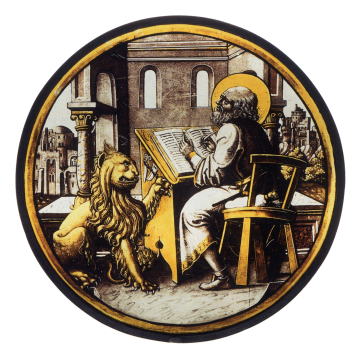 The drawing on this panel is very fine with delicate use of yellow stain confined to specific details such as the hem and cuffs of the saint’s robe, the capital and base of the pillar, the lion, desk and chair.